9 Cannonball Road, a fresh concept in residential development, is an innovative coupling of twenty four new, pet-friendly apartments over an existing animal hospital. The sensitive massing and material use of the development on this focal site serves as a model to the Pompton Lakes, New Jersey community revitalization plan. Rfa’s design also weaves many features specific to our animal care work into the residences and larger development, including retail, pet boarding and grooming, to bring people and animals together in this sustainable, affordable community. 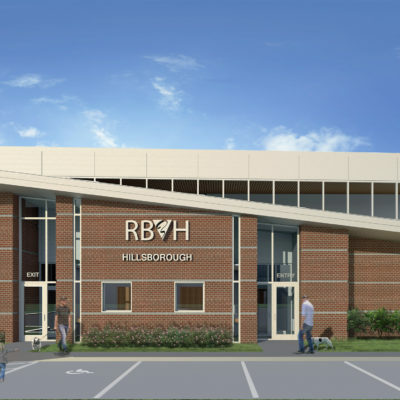 The now world renown Red Bank Veterinary Hospital (RBVH) in New Jersey, the largest privately owned veterinary hospital in the U.S., is creating a series of satellite hospitals in order to meet the demand for easy and convenient animal medical care for local area residents. One of the first of these satellites is RBVH in Hillsborough, NJ. Designed to be built in phases, Phase 1 includes primarily General Medical Facilities and Phase 2 includes primarily Specialty Medical Facilities. Located on the island of Puerto Rico, not far from San Juan, Manati Veterinary Hospital will become one of the finest and most progressive Veterinary Hospitals in the entire Caribbean. The project is designed to reach out to and welcome its clients, enable them to see and experience the broad spectrum of services and amenities offered, and to impart a lasting memory of each visit. Clients will pass along a beautiful Koi Pond and a zen-like waterfall as they approach the entrance. Inside the Waiting Area, overhead above the Exam Rooms, clients will be able look up and see the Cat Boarding Condos, Cat Play Areas and the Grooming Suite. From a historical standpoint, the Sacramento Animal Hospital was the first animal hospital in Sacramento, California dating back to the early 1940’s. 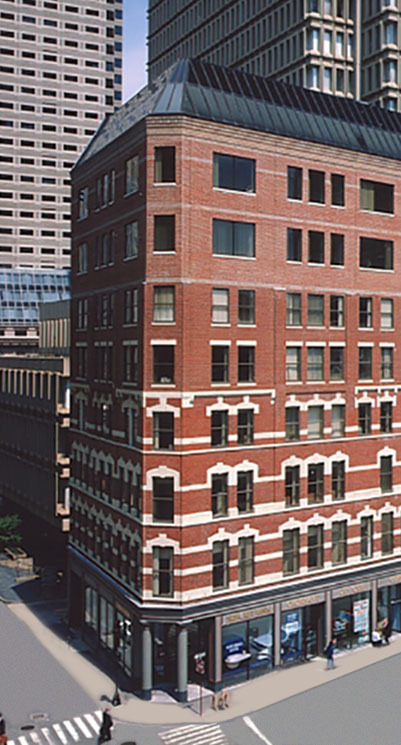 Technologically outdated and physically obsolete, its old building was in need of replacement. 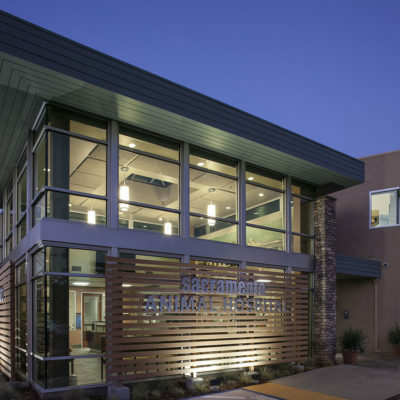 The new Sacramento Animal Hospital is a two-story building of 5,782 SF designed and constructed on a challenging 19,258 SF triangular-shaped lot. This project required the acquisition of an adjacent property with subsequent parcel merger (lot tie) and lot-line adjustments. To maintain the hospital’s business operations during construction, this project was completed in three phases of migratory construction. The end result is strikingly contemporary architecture with enhanced biophilic design principles and features infused into its core detailing and spatial environments. 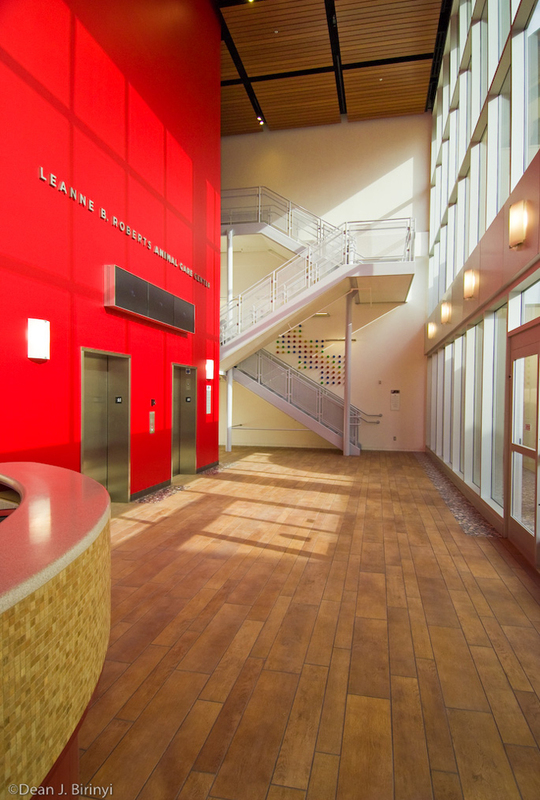 Combined, these design elements give this building its unique sense of place, warmth, and comfort to both its employees and the East Sacramento community it serves. 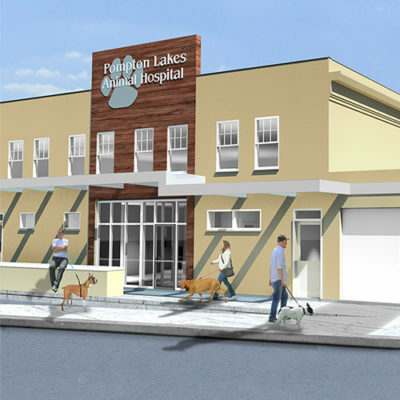 Located in the heart of downtown Pompton Lakes, NJ, the existing hospital will be completely renovated and a major addition will be added to provide Dog Boarding that includes Luxury, Deluxe and Standard Suites on the Ground Level. Cat Boarding is provided on the Upper Level which includes Cat Condo Suites plus a large Cat Playroom with custom design Cat Play structures, all with view to the exterior. 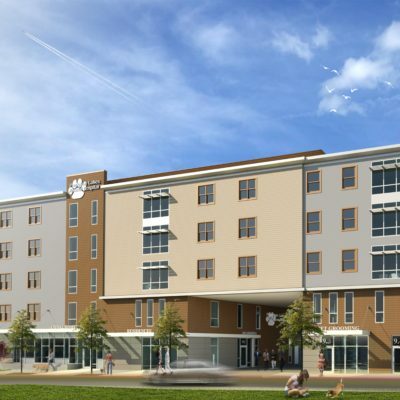 The City of Pompton Lakes was so impressed with the design that it has offered the Owner the opportunity to add 2 to 3 stories of Resident Rental Apartments above the proposed project. 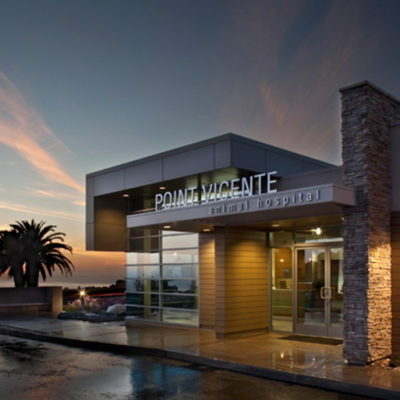 The Point Vicente Animal Hospital is a single story 5,760 SF general practice hospital for Dr. Cassie Jones on the Palos Verdes Peninsula in Rancho Palos Verdes, California. The hospital is in a unique and historic location with spectacular vistas of Catalina Island and the Pacific Ocean. Point Vicente Animal Hospital’s design was in-part inspired by its nearby coastal neighbor – The Wayfarer’s Chapel by Lloyd Wright. An abundant use of glass conveys transparency to bring the magnificent Pacific Ocean view right into the Reception Lobby. Its composition of alderstone, “Desert Suede” colored walls, classic bronze roofline and exterior Teakwood accents creates a look of contemporary yet understated elegance. 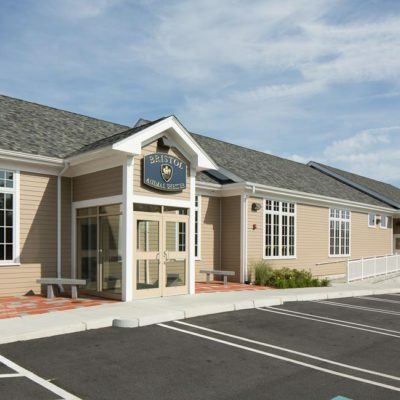 Gold Coast Veterinary Specialists is a 5,600 SF specialty referral hospital serving the veterinary medical needs of Long Island’s pet owners as well as other referring veterinarians throughout the New York Metro Region. Cardiology, Dermatology, Electrocardiography, Endoscopy, Neurology, Oncology, Ophthalmology, Orthopedics and Physical Therapy Services will be offered in this state-of-the-art, LEED Certified facility. 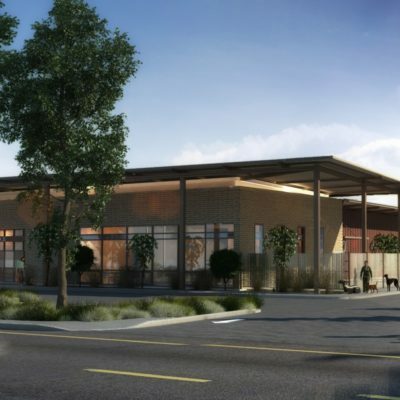 In addition, the new hospital expands the adjacent campus of the renown RFA designed West Hills Animal Hospital and Emergency Center which previously won a national design award. 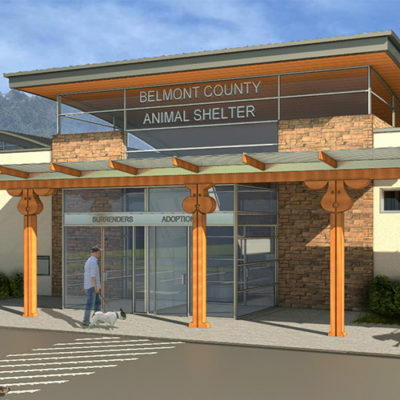 Nestled in a large wooded area on a steeply, sloping site, the new Belmont County Animal Shelter will fulfill the animal care and adoption needs of a large portion of Ohio. A central Interactive Corridor will lead visitors along an enjoyable, intriguing and educational path that will enable potential adopters to find, see, experience and interact with pets that may become new members of their family. The new Shelter will contain, among many other components, Adoption Counseling Rooms, a Pet Retail Shop, Dog Bonding Cubicles, Indoor Dog Exercise Yards, Communal Cat Playroom, Public Grooming, Self-Serve Bathing and Human Education Rooms. This nearly 25,000 SF small animal shelter will also contain a Veterinary & a Spay Neuter Clinic. In addition there will also be an Equine Barn with 10 interior horse stalls and 10 exterior paddocks. The K9 Resorts chain of pet boarding facility franchises had already become well known and well respected in the state of New Jersey. However, the entrepreneurial Owner of this new K9 Resorts, located in Madison, N.J., wanted to elevate the typical architectural design to an entirely new level. In fact, the new and improved design is already paying off, as K9 Resorts in Madison has become the single highest grossing facility, significantly above all the other franchises. 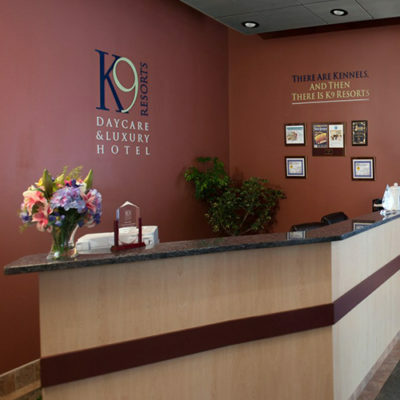 Canine boarding includes luxury suites, executive suites and standard cages. A client tour corridor allows visitors to preview the various accommodations. Separate indoor canine playrooms are provided for small dogs and large dogs. Separate exterior play yards are provided for small dogs, large dogs and special needs dogs. Deep within the seaside community of Bristol, Rhode Island lies a picturesque 23 acre parcel of land half donated by the Town of Bristol and half donated by a private citizen, to become the site for the new Bristol Animal Shelter. The project is a joint effort between the Town of Bristol and Friends of Foley, a local animal welfare organization. The goal is to create a truly compassionate haven for lost, abandoned or abused dogs and cats, while they wait to be adopted or reunited. The project also includes a spiritual-like mausoleum for 4-legged family members who have passed away, a sanctuary for quiet contemplation. Placer County needed a new regional Animal Shelter to be centrally located in Roseville, CA. The new facility will provide animal controls and animal sheltering services for south Placer County, plus three other local communities together with the close involvement of the Placer SPCA. RFA’s design organized the entire shelter around an Interactive Corridor that enables visitors to see, experience and have access to adoptable dog & cat housing, get acquainted rooms, pet retail, outdoor play & exercise yards, meeting rooms and a large multipurpose room including humane education, training and obedience. The shelter also contains administrative offices as well as a shelter veterinary medical component. Park Centre Animal Hospital is located in Northern California on Alameda Island in the San Francisco Bay Area. This new veterinary hospital was designed for Drs. Mary Applegate and Kathy Wydner. 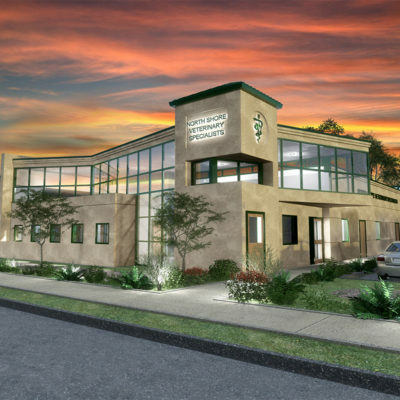 It is approximately 5,295SF and was designed to replace their 50 year old hospital of approximately 2,000SF. The new Park Centre Animal Hospital operates as a full service veterinary medical center offering medical, surgical, dental, preventative medicine and diagnostics for small mammals, birds, reptiles and amphibians. 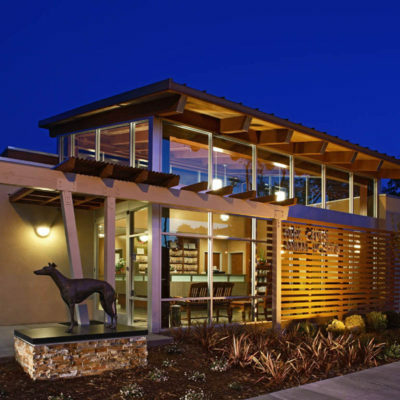 This new facility’s veterinary architecture design is contemporary and was inspired from the craftsman style. The exterior architectural treatment reflects a discriminating use of metal roofing, espaliers, performance glazing, shiplap siding and plasterwork. The warm earth tones on the building and the landscaping used for the site were also selected to complement the surrounding residential area. 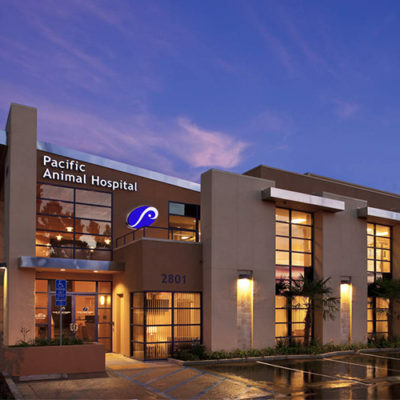 Pacific Animal Hospital has been serving the community of Oceanside and neighboring areas for over forty years. 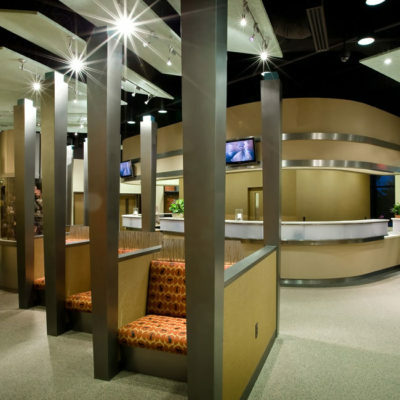 The new hospital operates as a full service veterinary medical center offering advanced medical, surgical, dental, preventative care, physical therapy and diagnostics for companion animals. The new 2-story, 6,780 SF state-of-the-art hospital was designed to replace a smaller and technologically obsolete hospital on the same site under a phased migratory construction plan. This new facility allows the hospital to continue providing high quality veterinary care for the same community it has served for generations. 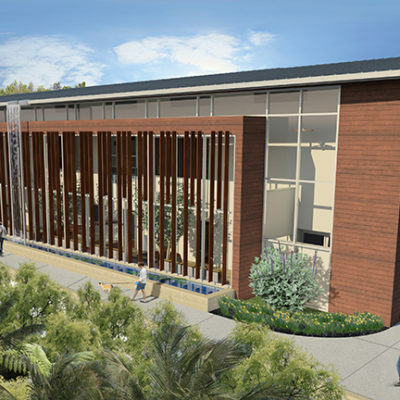 Our objective was to create a unique modern veterinary hospital design that would balance the multitude of culturally diverse architectural influences in Oceanside together with its rich surfing history. Its design evokes the images of surfing under a pier at sunset, with its column-like sand-colored vertical elements juxtaposed against a deep blue wave. 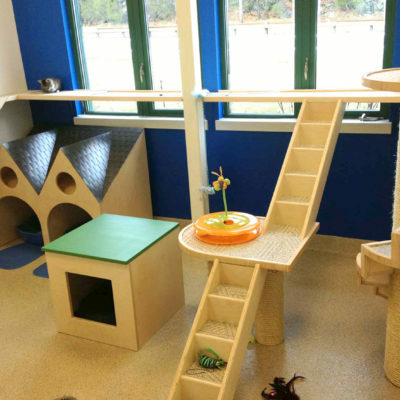 The Northeast Animal Shelter in Salem, MA received a donation from a national pet food company to renovate its’ three Cat Play Rooms. RFA was retained as the Architect to design these unusual and unique playrooms. The design consists of an assortment of bridges, terraces, spiral stairs, straight stairs, ramps, balconies and scratching posts in order to create a fun-filled experience for the feline members of the shelter community. In addition there are colorful wall boxes and floor boxes for the cats to rest in and/or find solitude in. The cats also have private litter box houses, designed to resemble miniature New England homes with faux slate roofs. All in all, people say it makes them want to be a cat.